The Independence Day Speech They Would Never Deliver! [This is an AHRC article, first published by the Asian Human Rights Commission. There is nothing amiss here. The nation is in celebratory mode and it is celebrating with aplomb. The national flag, the tricolour, is everywhere: being waved in the hands of children, tattooed on the cheeks of enthusiastic youth, flying high on the walls. And, it has, for a change, ensured a full meal to the street children selling it. The celebration is orchestrated to the last details of the ritual. It began, and has remained so, for more than six decades, with the Prime Minister hoisting the national flag on the ramparts of Red Fort, followed by his Independence Day speech. The customary speech of the Prime Minister has taken into account the state of the nation. Everything that matters, as per the government's perception of course, has figured in it: the joys of progress it has made and the concerns it has are all there. The Prime Minister is happy that the internal security situation of the country has improved, including in a troubled area like Jammu and Kashmir. Similarly, 'disturbed' areas like North-East, however, failed to find a mention. The Prime Minister voiced his concerns regarding the lack of political consensus slowing down the growth and vowed to 'do everything' to boost the economy. He called upon all stakeholders including the political parties to work together for 'reducing' corruption. He promised to create new jobs and to expand the National Rural Health Mission all over India. He assured the villages living in darkness, in the era of information technology, of his will to connect them to electricity. Good intentions, indeed! Even better is that he knows, despite all the customary celebrations, real independence will come to India only when "we will be able to banish poverty, illiteracy, hunger and backwardness from our country." How we will do that, though, is something he chose not to discuss. 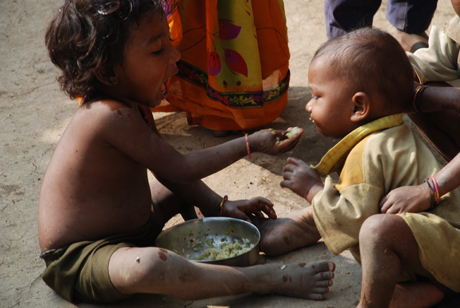 "Malnutrition in our women and children is a matter of concern for all of us. We have taken a number of steps to tackle this problem, including two new schemes. We have also decided that we will start implementing an improved Integrated Child Development Services scheme within the next six months so that the problem of malnutrition in children can be effectively addressed." Mr. Singh had promised a food security law that would provide families living below the poverty line 'a fixed amount of food grains every month at concessional rates.' Resolving to root out malnutrition from the country, he seemed particularly candid that year. He pledged to bring all children below the age of 6 years under the protective cover of Integrated Child Development Scheme (ICDS) by March 2012. The date has come and gone without the government claiming success or explaining reasons behind failure. It could not, for none other than the President himself would have called the bluff in his acceptance speech. Judging by the Prime Minister's obsession with economic growth continuing unabated, that observation would seem intriguing to say the least. Unmistakably, the President and his government are not in the same boat. Not that the Prime Minister differs on the count of diagnosis of the disease, as he too claims to be ashamed of the fact that 42% Indian children are malnourished. He just seems unable to walk his talk. The Prime Minister is very serious on corruption as well. It is just that for him such high rate of malnourishment among children is not a form of corruption in itself. This happens because of large-scale siphoning off from the funds earmarked for welfare initiatives like ICDS and Public Distribution System (PDS) bothers him even less. His stoic silence over his own government's role in bending the rules to help private entities minting money out of scams like 'humanitarian' export of non-Basmati rice to several African countries is proof enough for the fact. Yet, one would have to acknowledge that it takes some 'courage' to feed hungry of the world with million starving in one's own backyard. As pointed out earlier, the government's lack of seriousness on the issue is betrayed by the fact that Prime Minister's National Council on Nutrition, set up with a definitive mandate of tackling malnutrition way back in 2008, has not met but once ever since. That not a single decision, taken in that single meeting, such as ‘revitalizing ICDS’, has ever been implemented is beside the point. That the nation is well equipped to eradicate hunger merely aggravates the wound of India being home to hunger. There is no shortage of funds; after all, we are a country pursuing the project of sending a manned mission to moon. Neither is there any dearth of food grain. We have a buffer stock many a times bigger than we need, a significant amount of which rots for lack of storage capacities. In fact, the situation has alarmed the Supreme Court of India, directing the government to give the grains 'to hungry poor' instead of it 'going down the drain'. The Prime Minister, ever serious for alleviating hunger in his Independence Day speeches, took no time to oppose the directive while curtly telling the Supreme Court not to 'get into the realm of policy formulation.' Thankfully, though, he did not elaborate on whether the policy formulation focused on keeping the poor hungry. This seems to be exactly the case, considering a subsequent decision of the Cabinet Committee on Economic Affairs (CCEA) approving the export of two million tonnes of wheat from Government stock, at subsidized rates, as fodder for livestock in the developed world. It would want to listen to the government announcing not only the development of another intercontinental ballistic missile but also a scheme that would cover all Indians, irrespective of their socioeconomic status, in a social security net. But, they would, perhaps never, deliver that speech. For, doing so would require a radical restructuring of the republic and its institutions, which is something the deep, vested interests, entrenched in the system, would not want for the fear of losing power. It would require making the institutions, and people in power, responsible to the citizenry, which would unsettle the empire of corruption, vested interests have so painstakingly built. Therein lies the catch. A democracy can be nothing else but deficient with so many hungry stomachs. Superpowers do not run on hungry stomachs either. President and PM don't share the same boat? But they were sitting together in that boat till the other day and president, concerned about the hungry poor, was making the policies. May be his concern should be read more as a confession? You got it absolutely correct sir. Wanted to get the point across as a subtle irony of those leaving the effective Executive start picking problems with it immediately. On a very different count, it adds immense strength to the argument that President and 'his government' are so distanced from each other as well as reality.